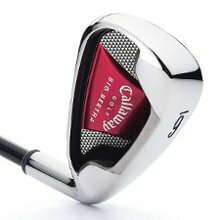 For the player looking for a solid, game improvement iron that provides a proven combination of forgiveness and styling, Callaway Big Bertha irons remain the undisputed leader. All of the core technologies - S2H2, Tru-Bore, and VFT - that have made Callaway Golf irons the #1 irons in golf for eight straight years are part of the DNA of Big Bertha Irons. Add to those innovations extreme Notch Weighting, deeper 360-Degree Undercut Channel, and a constant width sole and you have a game-improvement iron that explodes with technology.